Presto will try to download only the updated portion of the program and save time. Fastest Mirror will speed up your downloads by finding the fastest source near you. This entry was posted in Linux on July 9, 2011 by WebRuss. When I upgraded to Ubuntu 11 on my Dell Optiplex 755, I noticed that skype would not work. I use skype quite a bit so I needed to find a solution. I have a Microsoft Lifecam vx700. This is a usb camera and microphone combo. No matter how I tried the camera would not work with skype. Here is my solution gleaned from dozens of other sites. I take no credit for the solution below, I merely brought it all together into one post from bits a peices I found in different posts on the skype and unbuntu forums. One note, I use Ubuntu in classic mode so my directions reflect that gui mode. I’ve seen similar solutions that suggest renaming the actualy skype binary to skype.real and then name the shell file skype. I don’t reccomend that solution as future updates from the update manager will overwite your script. This way even if the update manager upgrades your skype install this will continue to work. Step 4. Modiy the launcher. Click close for the launcher and close for the menu editor. Done! You should now be able to use skype with your camera. Hope this helps you! This entry was posted in Linux on June 24, 2011 by WebRuss. I recently upgraded my Fedora 11 box to Fedora 12. No big deal, download the ISO and burn a CD, reboot and upgrade. Well then I read a cool article on upgrading from a usb drive. I thought I would give it a try. I was not disappointed. 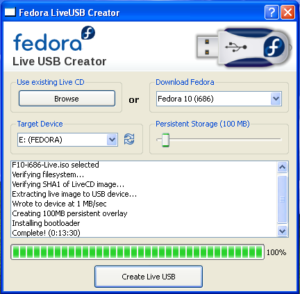 I simply followed the directions over at: Live-USB-Creator and turned my 2GB USB flash drive into a portable Fedora Install Device. On my computer it needed a couple of additonal dependencies. I pressed Y and let it finish the install I then went to the Menu–>System Tools–>LiveUSB-Creator and authenticated as root, the screen popped up. The process from here was easy I selected the distribution I wanted and let it do it’s thing. A few mimutes later I had a bootable thumb drive with FC 12 on it ready to go. I have heard that some people have issues with the download of the image. The tool does provide an option to select an ISO image from your local drive to install. Overall this is a great tool. I reccomend it. This entry was posted in Linux on February 1, 2010 by WebRuss. The problems cropped up in the custom ADODB connection. That really doesn’t work. But no biggie I was able to complete the conversion with not too much effort. Now here is where it got fun. I started thinking about if I could convert a VB application to php. I’ve written hundreds of VB applications all the way from vb 2.0 to 6.0 (yeah I’m that old) and I know php well enough to convert the application. The process would be much the same. I have an old vb 6 application I am going to convert into a php web app. This should be fun. I will let you know the results soon! This entry was posted in Linux on July 5, 2009 by WebRuss. Evolution now has a Google calendar provider. This means that I can see my google calendar and add/edit/delete events through Evolution. This is a great feature and really easy to set up. Go to File->New->Calendar and the New Calendar dialog will open. Select Google from the Type dropdown. Enter your google username and password. The default refresh is 30 minutes. I changed it to 15 minutes becuse I use my calendar for many events. Using SSL if you travel and are often on unsecured wireless systems. A little tip* enter your username and password before you attempt to pick which Google calendar you are going to use, especially if you are not going using your default calendar. The color option is for the color of the items as they appear on your calendar. This is handy if you have multiple calendars and want to distinguish the items. I clicked the “Mark as default calendar” option so that any new appointments are by default added to the google calendar. My tool of choice for editing many kinds of files including HTML is gedit. It is a clean and easy to use tool. I often have to work with old html websites. The HTML is often quite a mess with missing closing tags or just plain poorly written. I’ve also used this to fix code I was attempting to insert into site editors using the XHTML standard. Gedit has many plug-ins. One of my favorites is HTML-Tidy. This is a link to the author’s site. Take a look and see if it helps your coding. Yesterday I upgraded my workstation, a Dell Optiplex 755, to Fedora Core 11. I downloaded the net install CD iso and burned it to disk. The installation was super easy. I am a big fan of mjmwired.net and I use his install guide. The part that pleased me much was that the dual screen problems seem to be sorted out. I have two Dell 17 inch LCD monitors running on an ATI card at 1280X1024. Using the Gnome Display Preferences app I was able to configure my dual screen system in a few second. Quite pretty out of the box. Here is a screen shot: Click the thumb to see a bigger version. *Evolution Exchange MAPI – The new project to get evolution to sync better with Exchange servers. I was hopeful but alas I get an error. Maybe in time. You must include mono-basic to get the vbnc compiler. This package is not a dependency of monodevelop. This entry was posted in Linux on June 15, 2009 by WebRuss. I spent the day trying to no avail to get Evolution to talk to the company exchange server. It seems the new OWA light is not compatible. There is a project right now for FC 11 that will use the new Evolution MAPI connector. I am so hopeful that it all works! This entry was posted in Linux on June 5, 2009 by WebRuss.